Samsung has released two variations of its Gear S3 smartwatch to appeal to a greater niche of wearable technology users. The Gear S3 the outdoor version of its sleeker brother the Gear S3 Classic, is big, thicker and wider than its predecessor the Gear S2. You may choose not to go out with your smartphone as Gear S3 comes with a 4G LTE connectivity which uses your mobile data plan to allow you to send texts, get emails, receive notifications and even make calls all without going through the stress of taking your device with you. The Samsung Pay on your Gear S3 allows you pay for what you buy anywhere you can use a credit card, without moving around with your wallet or device. 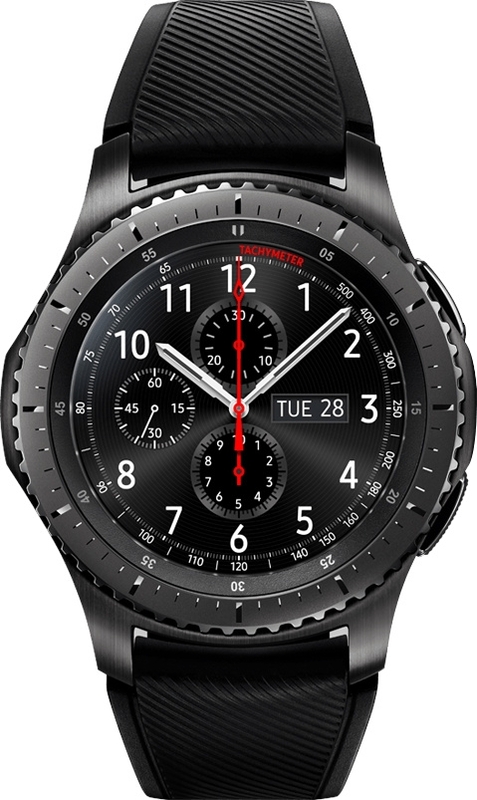 Samsung Pay on Gear S3 requires network connection through LTE, Wi-Fi or via Bluetooth pairing with compatible smartphone. After the initial setup, Samsung Pay on Gear S3 can make at least five transactions without reconnecting to a network. The Gear S3 houses a built-in GPS that keeps you on the map. This means you don’t need to bother about missing your way whenever you choose to go round the city as your Gear S3’s GPS will be available to guide you. Based on IP68 rating, Samsung says that Gear S3 has military-grade durability, this makes it waterproof ( MIL-SPEC-810G rated to withstand drops of about 5 feet) and dust resistant. It resists extreme temperatures too. Gear S3 also features a Corning Gorilla Glass SR+ watch face to help protect against scratches. Equally good for climbing mountains and commuting. Though quite heavy, it is worth it as it houses a catchy stainless steel. At the right side of the Gear S3, you will find two buttons, the upper button is a universal back button while lower button takes you back to app menu. The 1.3-inch AMOLED screen gives bright and colorful images with a resolution of 360 x 360 pixels. Gear S3 saves you the stress of installing apps through smartphones as you could choose to install those apps directly on your Gear S3. The Gear S3 battery can last three days on a single charge as the wireless charger allows you charge up when your battery gets low. Your smartphone can pair through bluetooth with the Samsung Gear companion app. TT Polls: Should NCC fine GSM networks for poor service quality?